In two hours yesterday evening we got round almost all of the village, singing our socks off. Sorry, to people beyond the Hall on Chard Road and at Drimpton Cross for not getting to you this year. With a team of eager door knockers - Will, Jake, Abigail, Harry, Jess, Chloe and Lily we managed to raise a lot of money. Back at the Hall with refreshments served up by Rosemary the children set about counting it all up. They stopped countng at £250.81! A truly astonishing total. Thank you to all the givers. Later in the evening there were added donations of £9.50, so making an even grander total of £260.31!! This will be divided equally between the charities Shelter and Crisis at Christmas, both helping homeless people. Didn't we do well?...... Oh yes, we did! Well done everyone for making it such a special evening at the Hall yesterday. It was an absolutely grand show in such a warm and supportive atmosphere. It was like a tonic for everybody there. Times when we all come together to make something bigger than we as individuals are capable of is what helps make communities happy and strong! Many thanks to our raffle ticket sellers, Rosemary Coates and Jane Fry - they worked their socks off. As for the fundraising part - well, roll on the drums, please..... We raised the ASTONISHING, EXTRAORDINARY, INCREDIBLE, STUPENDOUS, GOBSMACKINGLY HUGE SUM of........... £471.92!!!!!!!!!!!!!!!!!! We have never raised so much before! I had such a good time counting it all last night and will send off our cheque for that sum to ClicSargent asap. Now rest before Carols by Candlelight at the Chapel on Sunday at 6.30 and Carol Singing Round The Village on Monday at 6.00 for which we need people to collect money as well as singers - all of you of all ages would be most welcome!!!! FIRST WORLD WAR COMMEMORATIONS: In early 2014 poppy symbols were placed in each of the villages which form the Clapton, Wayford, Drimpton and District Horticultural Society and poppy seeds were sown by the bridge on Chard Road. Like the poppies, the commemoration grew and Drimpton marked the centenary of the end of War with a week of activities that brought the community together in a common cause. Poppies were created in a variety of materials, appearing around the village in every shape and form. So many people got involved and contributed enthusiastically to the week of events which ended with a moving production of Archie Dobson's War. The events and activities were supported with the help of a grant from West Dorset District Council Chairman's Centenary Fund for which we are extremely grateful. The moving poem "Seven Men in Seven Days" by Chris Fogg and the beautiful collage created by Jenny Beck and her team are permanent reminders of the Commemoration Week on display in the Village Hall. On Remembrance Day itself the Act of Remembrance was conducted by Neville Adams followed by the village lunch. 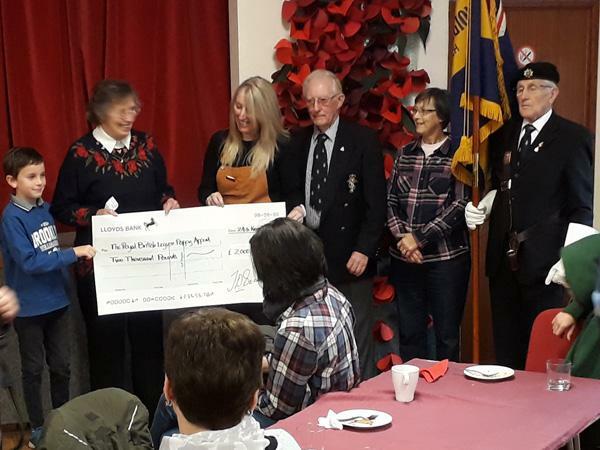 Proceeds from all the events and activities were presented to representatives of the The Royal British Legion Poppy Appeal at a special coffee morning on 24th November in the Village Hall when a monumental cheque for £2000 was handed over. A huge thank you to everyone who was involved in whatever ways. It was truly memorable. Message from Viv Watts – Commemoration Lunch - “The finale to the Commemorations of the WW1 Centenary was the village Sunday lunch on November 11th. This was attended by over 60 villagers who sat down to a hot two course roast lunch. Rosemary and I would like to thank everyone who helped make this a special day of remembrance which raised a magnificent £512.50 to be added to the funds arising from the other activities which took place in the village.” This was given to the Royal British Legion Poppy Appeal on November 24th – see above. The Annual Village Get-Together. It's our way to kick-start Christmas! Our popular qigong exercise sessions are continuing at the Village Hall through the winter. Gentle, balancing and hugely effective, the last two this year are 4th and 11th December, then starting again from 8th January – Tuesday mornings 10.30am to 11.30am. Call Monica Murphy on 01460 74193 if you’d like more details. Horticultural Society Annual Christmas Dinner on December 15th at the Royal Oak 7pm for 7.30pm. £15 for 2 Courses. £18 for 3 courses. Members/Partners/Friends welcome. To check late availability tel 01308 867372. Spaces are still available. If you would like to come, please phone Viv (868005). £12 per person, which includes a glass of wine. Payment needs to be made by Tuesday Dec 4th. Please come wearing something festive! CANDLELIT CAROL SERVICE at NETHERHAY CHAPEL on SUNDAY DECEMBER 16th at 6.30pm. “This is always a wonderful part of Christmas in our village. CAROL SINGING AROUND THE VILLAGE on MONDAY DECEMBER 17th from 6.00pm - Each year Drimpton Carollers meet up to sing. We always raise funds for charities for the Homeless. Wrap up against the cold, wear wellies, and bring a torch to help light our way and read the words. We also need door-to-door collectors. If you’d just like to rattle a tin, please come along….. No auditions needed! Christmas Day Communion at St Mary’s Church starting at 10.30am, service led by the Revd. Elfrida Savigear. The first lunch of 2019 will be on Wednesday, 16th January at 12.30 at the Village Hall. There will be a choice of soups and cheese and biscuits - suitable for all diets and tastes, including those whose New Year Resolutions concern their diet! Just £4.00 per person. provided by Rosemary and her Team of cooks. Please phone Rosemary to book a table and any special dietary requirements. All Proceeds to the Horticultural Society. Village events for the commemoration week concluded with the presentation of a cheque for £2000 raised by the Drimpton community and friends, presented to the Royal British Legion Poppy Appeal. At the time of going to press POPPIES have already started appearing. The first are in the 'garden' of borrowed plants in pots by the village bridge. Thanks to everyone who loaned the plants to help make it happen. MORE POPPIES will be appearing around the village. Watch out for them. Don't forget to come along to the free events that are happening. Poppy Making Workshop -all materials provided as well as tea, coffee and biscuits plus homemade bread and soup!! at the Village Hall. A fascinating talk by guest speaker Paul Davies from the National Archive at Kew about the Role of the Dorset Regiments and the Impact of the war on this area both during and after the hostilities. Food provided, at The Royal Oak. Wednesday 31st Oct. 14.30pm -Tea Dance and Tiffin. A fun afternoon where you can try out your Strictly Come Dancing moves and recover with a delicious home-made Drimpton style tea at the Village Hall. Come and enjoy a screening of the film, 'Oh What a Lovely War'. Bar, tea, coffee and local ice creams will be available from the usherettes. At the Village Hall. Bring along all those Poppies you have been knitting and crocheting to the Village Hall and help to create some memorable displays in and around the Village. This powerful and moving play chronicles the events that shaped the War through the eyes of the Dobson family in words and songs, performed by adults and children. The Evening Performance at 6.00pm is SOLD OUT, but there will now be a MATINEE at 1.30pm. Tickets are selling fast - £3 for adults, children free. when those who made the greatest and final sacrifice in all conflicts, will be commemorated. “Friday 9th November - Matthew Medley will be hosting a Games Competition Night. Then on Friday 23rd the Club is going Bowling (buses leaving the Hall Car Park at 6.30 prompt). The DELIGHTS of TECHNOLOGY! “Computers, tablets, mobile phones. Love them, hate them, happy or confused?” People have expressed an interest in getting help and Brian will be offering it during the winter at a time to be decided. Contact Brian to know more. MATINEE - Doors open at 2pm for a 2:30pm start. Teas, coffees, soft drinks etc available. An historical drama following a London based writer who exchanges letters with residents in Guernsey following the German occupation; She is intrigued by the rather odd name of the society and makes plans to visit the island….but not everything goes to plan, of course! EVENING - Doors open at 7pm for 7:30pm start. Wine, beer, soft drinks and teas and coffees available to start your evening. Daniel Day-Lewis’ swan song movie. He plays a difficult, troubled, introverted yet brilliant dress designer in London in the 1950s. His life is incomplete but he meets Alma a waitress who at first appears gentle and forgiving but is as ruthless and strong willed as Reynolds himself. An intriguing finale to the illustrious film career of Daniel Day-Lewis. Learn how you can make your Garden more productive. Claire will explain that however small your Garden is you can use it to grow fresh vegetables and flowers. Learn how to use space effectively and alternatives to planting in rows. It's said that by using a square grid system you can achieve the same yields with 80% less space and it's less work. Sounds too good to be true? Come to the meeting. Members and non members welcome. “They will bring us a wonderful mixture of Christmas and other songs, and stories too. Followed by tea and home made cakes. £4 plus collection for Air Ambulance. There has been so much positive feedback from the performance of Archie's War that I cannot find anything more to add myself but I feel some of the comments are worth saving for future readers. “I’d like to echo John’s words (and Brian’s and everyone else’s previously). Thank you, Nick and Francesca, both for your hard work and commitment, and also your vision, in imagining this week in the first instance, and then enabling all the different elements of it to happen and come together so successfully. It has been the most extraordinary week, with so many different events happening, each one of them an outstanding success, all happening, not because of funding, but because the people of the village believed in the importance of commemorating this centennial anniversary, focusing on how those dreadful times of WW1 impacted on our own local village, but how they now continue to bind us together as a community, bringing out the best in everyone. “Hearty thanks to everyone for allowing us to be a part of such a memorable event. I think you've done those seven boys proud. “I am just writing to congratulate you and all the members of the cast, along with the production team, for the excellent performance of 'Archie Dobson's War'. From the outset we were captivated, straight into life in Drimpton with the locals singing their hearts out for 'their' piece of local Dorset. The dialect and familiarity of local place names grounded us immediately. It would be great to hear that particular song sang more often; perhaps you do sing it at various Drimpton gatherings? There are so many highlights of such a poignant remembrance play that it is hard to raise one above the other; be it the main role by Jake Costin - having such confidence and character portrayal - just brilliant, or the recruitment officer (presume to be yourself?) making us (the audience) feel guilty for not singing loud enough which really brought home the 'playing on ones consciousness' for not enlisting with the war effort. For us, we were totally absorbed in the moment by the reflective story telling from the nurse, and the German 'Fritz' (Martin Higgs) carol singing in German. The pace of the dialogue and clarity made it so easy to follow. The attention to detail, props and costume, also contributed to the overall professional presentation. The family contribution - ie The Costin's, Medley's, Bellorini's and along with many other 'couples' and relatives, gave a sense of true community spirit, Well done Drimpton. We feel that we have been lucky to see such a great performance and although we will probably attended a local memorial service, it has left us thinking, "Who needs the Albert Hall, when we have been indulged in more significant event, just as dignified". We feel sure that each one of the seven soldiers would be very proud of you all, and how you are continuing to uphold their contribution by recognising this centenary. A plea to kids (and parents) There have been masses of tiny white plastic balls on the ground around Applefield and Marksmead recently. They may look harmless enough but are just the sort of thing birds and small animals may try for lunch and become seriously ill, or even die. Now that we know more about the tragic effects of plastic and litter on our wildlife and the environment, could we please avoid these and make Drimpton and our countryside a safe space? Qi gong exercise classes continuing - Our weekly sessions over the summer proved popular so tutor Monica Murphy is running more classes up until December 4th (excluding half term week). They're pay-as-you-go at £5 a session and are 10.30-11.30 on Tuesday mornings at the Village Hall. Qi gong is a great form of gentle exercise that restores and relaxes body and mind, and helps improve health, balance and general wellbeing. For more details, phone Monica on 01460 74193. POPPIES and POMPOMS – “Thank you to everyone who came along and joined in the Activity Coffee Morning. Lots took wool to continue at home. We are looking forward to displaying them at the Village Hall on Thursday, 1st November. If you need to return them before, please let Kate Hesketh or Rosemary Shepherd know. If you missed out in September but would like some wool and patterns, why not come along to the Village Hall on Friday, 12th October at 6.00pm where we shall be working with the Youth Club – see below. VILLAGE LUNCHES – 40 people enjoyed the Village Harvest Lunch. Thanks to the generosity of those who provided the food and raffle prizes, £170 was raised for St Mary’s Church. Matinee Doors open at 2pm for 2:30pm start. - THE DARKEST HOUR. Not so much a war film, more a political thriller. Does Winston Churchill Take the fight to Germany or negotiate a settlement? YOUTH CLUB at the Village Hall: “Earlier this year Emma applied to Waitrose to be part of their community green token scheme and the youth club recently received an amazing £212. A big thank you to Emma, Waitrose and all the people who popped those little green tokens in! Coming up this month on FRIDAY 12th there's Poppy Painting in preparation for the World War 1 Remembrance activities in the village (and the chance to learn a new skill!). poppies set among evergreen plants in pots on SUNDAY 21st OCT. Can you provide any plants? They will be returned to you afterwards. If you have any questions, contact Andrew. If you have anything to contribute could you please bring your plants to Brian (6, Post Office Yard) or Andrew (16, Chard Road) by FRIDAY 19th OCT. Thank you. Costumes wanted Do you have any ladies or gents knitted cardigans, men's or boys braces, white granddad collar shirts ( men's and boys) flat caps or other items that might have been worn in the early 1900's that you would be willing to lend out for the WW1 play that is taking place on Nov 3rd. If so please call Francesca Hurrell. Entry Free but any donations to the Royal British Legion Poppy Appeal. Mary and Sam Trott, along with Amanda Fogg, will show us a few dance moves for the Tea Dance which will be the following Wednesday 31st. Please come along and have some fun. This is not at all serious and open to all ages and abilities. If you don't want to dance don't let that put you off going to the Tea Dance as there will still been the usual Drimpton yummy cakes and good company. Come along and help make as many poppies as possible to use in the decoration of the Hall for the WW1 centenary events. Tea, coffee, biscuits and chat provided. Join us for some or all of the session - the more the merrier. A REQUEST! If you can bring a stapler & scissors that would be great, if not there will be some there to use. The most important thing is to come along - no artistic skills needed. Every poppy made will help make the display great! GARDENS & The WAR with Christine Stone on Monday 29th October 7.15pm for 7.30pm at the Village Hall ( Not our usual Gardening Club Wednesday) - Christine has a background in Broadcasting but more recently her interest has been in oral and gardening history. The first World War had a major impact on the gardens of our large country houses as many of the gardening staff became soldiers on the Front Lines. This talk will give fascinating insights into the social history of local gardens, the devastating impact of World War 1 on local communities and the enormous sacrifices made by so many of their staff. Of interest to both Gardeners and Non Gardeners. All welcome. - an evening with guest speaker Paul Davies from the National Archive, Kew. It is open to all, yes, everyone, even real book club members! Food will be provided by NNLBC members. There's no charge for the evening, but ample opportunity to make a donation to the Royal British Legion Poppy Appeal. For more information, please contact Brian. The culmination of activities commemorating the end of WW1 will be a village production of this powerful play performed by adults and children, illustrating through words and song a family's experience of the Great War. All profits to go to the Royal British Legion Poppy Appeal. 14th ANNUAL SUMMER LUNCH “A Day at the Races” on 5th August was a sell out and everyone came suitably dressed for a brilliant Day at the Races. The Hall was decorated beautifully thanks to the hard work of Jane, Janet, Kay and Viv and there was a jockey, racing commentator and an abundance of ladies dressed for Ascot and gentlemen looking exceedingly smart. They sat down to fresh salmon, ham, vegetarian pie, quiches and various salads with hot new potatoes and 10 different home made puddings and sweets with wine to match the occasion. This has raised a magnificent £415.50 for 3 different charities. Rosemary and Viv would like to thank everyone who cooked, helped on the day, and all those who attended for making this such another wonderful village occasion. Please bring knitting needles, crochet hooks and red wool if you have them. Plenty will be available on the day plus simple patterns which can be taken away to make lots more at home over the next 2 months. Tuition and demonstrations given by Knitters and Natterers and other crafts folk from the Village. For more information please contact Rosemary Shepherd. followed by a delicious Buffet Supper. This will be a delightful evening! The cost will be £5 and there will be a chance to buy home grown and home baked produce too. Gifts of home produce welcome. If you can, come along to help decorate the Chapel on Saturday 8th at 4pm. ART! Starting MONDAY 10th SEPT at Netherhay Chapel 2-4pm. Bring your own paints, pencils etc. There will be items to draw (still life) or bring your own project. If you want to paint but never seem to find the time, or would like to paint with others rather than on your own in a lonely garret... then this is for you! Contact Jenny Beck. Taking place the 1st, 2nd and last Wednesday of each month starting at 5:30pm - Cost £3 per session. Film Club the Village Hall - WED 12 SEPT - Doors open at 7pm for 7:30pm start with Refreshments to start your evening. Showing THE GUERNSEY LITERARY AND POTATO PEEL SOCIETY - A historical comedy drama - a writer exchanges letters with residents on Guernsey after the German occupation in WW2. She makes plans to visit the island. Not everything goes to plan, of course….. In October we will start matinees again on the second Wednesday of the month, featuring “Darkest Hour” which we showed in July, but that evening clashed with a rather important football match, so we will run it again for those who missed it. More details next month. YOUTH CLUB: Coming up in September we have Youth Club with Fun and Games on FRI 14th and 28th. VILLAGE 'HARVEST' LUNCH on WED SEPT 19th at 12.30 at the Village Hall – Viv & Rosemary's Lunch will be in aid of St Mary's Church. There will be a Raffle. Two Course Hot Lunch for £6 plus one (or more) of Neville's amusing stories. Everyone will be very welcome. No need to book for this unless you have special dietary needs. Please contact Rosemary or Viv if you have special dietary needs. Everyone can be catered for. We look forward to seeing you. GARDENING CLUB / HORT SOC on Wednesday 19th September at 7.15pm at the Village Hall. John Studley will be giving a talk on Vegetable Growing. John is well-known locally for growing champion vegetables. So if this year mice ate your beetroot, your carrots were curly and your leeks were rotting, this is the talk for you. Next year you could be a champion grower like John. 14th ANNUAL MACMILLAN COFFEE MORNING - Viv and John Watts cordially invite you to their 14th Annual Macmillan Coffee Morning on Friday 28th September from 10.30 to 12.00 at The Pin House. There will be a raffle, produce table etc. Everyone is very welcome to what is a wonderful morning for a great charity. The generosity of those who have attended previously has raised over £4500! YOUR VILLAGE NEEDS YOU !! Men and teenage boys urgently required to play the parts (no speaking required) of soldiers and/or sing in the WW1 commemorative play (Archie Dobson's War) taking place on Nov 3rd. For more information contact Francesca Hurrell. PLANT LOAN REQUEST - Poppies have flowered in the bed by the stream, at the heart of the village from 2014, the start of the commemoration of the First World War centenary. As that anniversary draws to a close this November, we are seeking any types of evergreen plants you may have, preferably in pots, for a planned display to be set up on SUNDAY 21st OCT. Plants will be returned to you afterwards. If you have any questions contact Andrew. If you have anything to contribute could you please bring your plants to Brian (6, Post Office Yard) or Andrew (16, Chard Road) by FRIDAY 19th OCT. Thank you. Following their sell out performance of 'One Man and his Cow' earlier this year, Living Spit return to Drimpton on SUNDAY OCTOBER 21st at 7.30pm with their not to be missed new show 'GIANTS OF SCIENCE'. With jarring jokes, pitiful puppetry, and the silliest of scientific songs you can expect a raucous romp through the hilarious history of scientific stupidity. Tickets £9 (Children £6, Family £25) francescahurrell@aol.com or www.artsreachco.uk. ; More info next month. Irene and Ann thank all those who came and supported our 'Cupcake and Cuppa' morning held on the 14th July. We raised £124.50 which has been donated to Mountjoy School Beaminster. “If you’ve been to the Village Hall to see any of the fantastic Artsreach shows over the last few years, you’ll know how much gratitude we owe to organisers Roger and Linda Smith. From The Life of Mrs Beaton, through Paradise Lost to the dance Last Man Standing, with forays to Tree House and the hilarious Gloriator and One Man and his Cow (to name just a few! ), they’ve regularly brought us music and magic, dance and humour, and the vital feelgood factor that makes our village so special. Organising shows is no easy task and involves much planning and hard work, not to mention the kind hospitality they offered to the artistes in their and neighbours’ homes on show nights. GENTLE SUMMER EXERCISE…..Qi gong (also known as chi gung) is a lovely form of gentle exercise, relaxing and restoring the body as well as calming the mind - great for improving health, balance and wellbeing. We've organised a weekly qi gong class at the Village Hall for six weeks over the summer. Our traditional village show; one of the major events in the Village calendar. An opportunity to join in, showcase your skills, have fun and view your friends' and neighbours' exhibits. or take that perfect photo. Why not enter? Come along to see what your friends and neighbours have been up to. Excellent home baked cakes and tea available all afternoon on the day. Entry 50p for non-members. Free for children. Reminder: Tickets for A Day at the Races - Our SUMMER LUNCH on Sunday, 5th August, 12.00 for 12.30 are SOLD OUT! Dress for the occasion in your racing colours or in something suitable for the Royal Enclosure! Beaminster Area Team Churches are providing a free holiday club day for families and in Drimpton Village Hall on MONDAY 20th AUGUST from 10.00am to 4.00pm. Children and families are welcomed, no unaccompanied children under 10. Play, Bouncy Castle, Activities, Crafts, all themed around a Bible Story. Tea, Coffee, Cake and make your own lunch. Come as a family and stay as long as you like. Do you want to sit in traffic on Bank Holiday Sunday? Not really. Instead, how about strolling to the village bridge and calling in at Haydon Villa to sit with friends, view the garden (maybe more than one), meet the chickens and enjoy light refreshments from The Village Café. You are cordially invited to do just that on SUNDAY 26th AUGUST between 2 and 5pm. All included for just £3.50 per adult, £2.00 per child. Proceeds are to help fund Village Voices to stage more community events and activities in the village. We are making great progress organising events for October 29th to November 3rd 2018. A variety of events and activities is being planned across this important week, which will commemorate the war years and in so doing, bring us all together in a common purpose. MONDAY 29th October (daytime) - 'Art Workshop' at Drimpton Village Hall. Come and learn how to make a variety of poppies to be used across the village and inside the Village Hall to mark the occasion. TUESDAY 30th October (evening) - World War 1 Talk at the 'Royal Oak' pub by guest speakers. WEDNESDAY 31st October (evening) - film club at Drimpton Village Hall, 'Oh what a lovely war!" Should you be interested in attending any of these events please contact Francesca Hurrell for more information. October 29th to November 3rd. A variety of events and activities is being planned across this week, but they can only happen with your input, help and support. The purpose is to create a week that will commemorate the war years and in doing so, bring us all together in a common purpose. To date, the proposed events include a number of workshops to learn how to create poppies in a variety of mediums and formats which will then be used across the village and inside the village hall to mark the occasion. There will be a tea dance, hopefully with live music and entertainment and maybe an opportunity prior to the day to learn a few steps. A World War 1 themed film night and talks are also planned. The final event will be a commemorative performance on Saturday Nov 3rd for which we will need a cast and a choir - no previous experience required!! We are also looking for any personal stories or memorabilia, so if you have anything you think may be of use please get in touch.